Chicken and waffles is one of my favorite flavor combinations. but restaurant versions usually include tons of saturated fat and and added sugar. That’s why I was determined to come up with the perfect recipe makeover. This recipe has all of the sweet and salty goodness of the real version while providing your body with a host of vitamins and nutrients. It’s also a perfect balance of protein, fat, and carbs to stabilize your blood sugar while satisfying your comfort food cravings! If using old-fashioned oats, put them in a food processor or mini food chopper and process until they resemble a flour consistency (similar to oat bran). Add garlic powder, paprika, salt, and pepper to oat bran and stir until evenly combined. Transfer to a plate. After chicken is baked, place under the broiler for an additional 3-5 minutes until tops are golden and slightly crispy. While chicken is cooking make the waffles. Using the waffle ingredients, combine dry ingredients and wet ingredients (except egg whites) in a large bowl. Gently fold in the frothy egg whites. Grease a classic waffle maker (not a Belgian waffle maker) liberally with cooking spray and make 4 waffles. Cut into quarters and set aside. Next, make the maple glaze. Combine maple syrup, soy sauce, and water in a small saucepan over low-medium heat. When mixture starts to boil, continuously whisk in flour and boil an additional 2 minutes. Take saucepan off heat and set aside for 2 minutes. 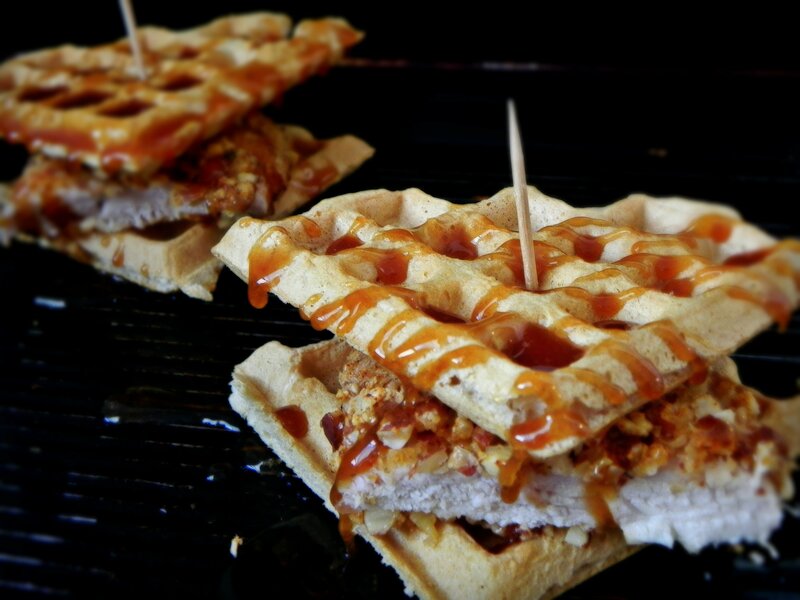 To assemble sandwiches, cut each chicken breast in half and put in between two waffle wedges. Drizzle each sandwich with warm maple glaze and serve immediately. *This recipe makes 4 total servings. 1 serving = two sandwiches as shown in picture above. Each serving includes 1 chicken breast and 1 full waffle.